Noticed this candy a few weeks ago while I was picking up a few items at our local Dollar Tree and I simply could not refuse to getting it. I've had it for a bit of time but have resisted eating it (sad, I know) that was until this week and I was a bit stressed over various items. It was the perfect time to enjoy this stashed candy bar. The bar is released in advance of the Transformer 2 movie that will be opening in just a few short weeks. 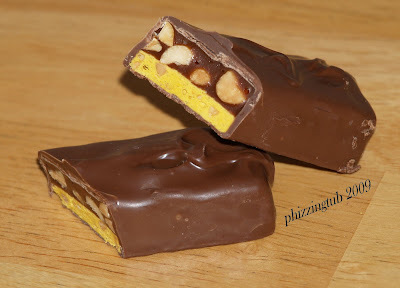 The candy bar is very much like a regular Snickers bar the two main differences you will notice are the yellow nougat and a slightly darker caramel otherwise it is the same as a regular Snickers bar. I love the Snickers ice cream bars. My, those are good.